Home How about that? Has anyone got a recipe for artificial gravity? ISS024-E-014263 (11 Sept. 2010) --- NASA astronaut Tracy Caldwell Dyson, Expedition 24 flight engineer, looks through a window in the Cupola of the International Space Station. A blue and white part of Earth and the blackness of space are visible through the windows. One of the underlying ideas in Einstein’s general relativity is that for an observer, the acceleration due to gravity, or the acceleration due to thrust, are identical. This is a consequence of the equivalence principle. This phenomenon is the way to achieve artificial gravity in space. No special material, no crazy technology, just a simple rotational motion: the same technology used in slingshots and amusement park rides will allow us to ‘ground’ ourselves in the depths of space. For every change to the uniform motion of an object, the principles of dynamics tell us that there’s a force behind it. The force could be friction, or the most complex particle integration we can think of; it can always be defined as a mass times an acceleration. And it’s the acceleration that we are interested in. We mentioned rotational motion as a means to achieve this, but a constant linearly accelerated spaceship could work as well (if fuel wasn’t an issue). As long as we can create an acceleration we can mimic gravity. Linear acceleration is what is used in roller coasters and other amusement rides. It is what we feel in a car when we suddenly accelerate. Any accelerating vehicle moving in a straight line would force the objects inside it to resist the movement, creating an appearance of gravity; even a low amount can bestow sufficient gravitational force to yield useful benefits. The rockets we use to get into space can already provide the kind of acceleration rate necessary to provide a 1g environment (Standard Earth gravity, 9.8 m/s^2). Unfortunately, these can produce such acceleration for a limited and short time (about a few minutes) due to the limited supply of fuel in our crafts. If we were to move away from the chemical rockets, and we were to use a propulsion system with a specific impulse (the impulse produced per kg of propellant) then we could create an efficient way to produce useful levels of artificial gravity for a long time. Gravity can also be produced by non-linear acceleration. By rotating the spacecraft around a central axis you can create a very similar effect to Earth’s Gravity, albeit with some issues. While linear acceleration is indistinguishable (unless you look out of the porthole), rotational induced gravity has a component that makes it quite distinguishable: the Coriolis Effect. 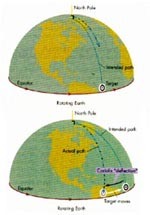 The Coriolis Effect generates a perpendicular force on an object moving towards or away from the axis of rotation. The reason why hurricanes and maelstroms move anti-clockwise in the northern hemisphere and clockwise in the southern is due to the Coriolis Effect. In a small spaceship, this could result in nausea and dizziness for the astronauts. If energy wasn’t a problem, supermagnets could offer a solution. We already know how to levitate small animals like frogs and mice, and since energy is equivalent to mass one could theoreritcally imagine that incredibly powerful magnets could be used to create gravitational fields. As always the development towards human-size levitation/gravitation devices might be technologically challenging, but they’re not impossible to create. Although having such a magnet pushing a person down might have other ill effects. Manipulating gravity is a completely different ball game. As far as we understand (and we understand very little) there’s no way to manipulate gravity in the same way we can manipulate electromagnetism. And materials such as HG Wells’ Cavorite are looking less and less possible.